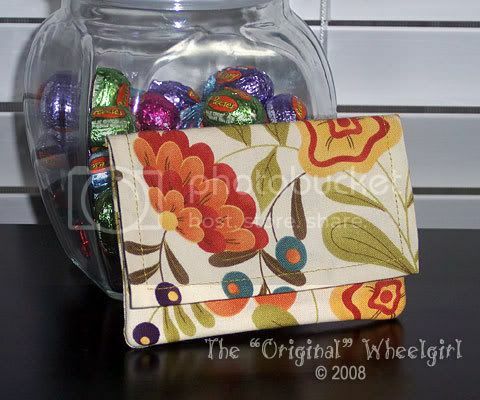 The Original Wheelgirl: First Wonder Wallet! 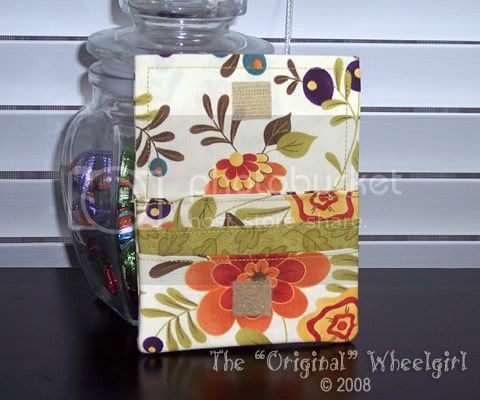 I've had the Wonder Wallet pattern by Joan Hawley (the Lazy Girl Designs DIVA!) for some time but it has intimidated me. Lish over at 25 Weeks Yahoo! group had as one of the February goals to make six (!!) of these things. Well needless to say I didnt meet that goal...I'm just now getting around to the first! Sigh. They are pretty quick to make, and this first one I used leftover scraps from my Miranda Bag (see this post) to whip it up. Unfortunately I only had a 3 inch strip of the cool stripe fabric, and the pattern calls for larger strips than that. So I only used the floral print and the green leafy print. I had trouble with the bulk, and my velcro doesn't line up! Next time I will save the velcro on the cover until last, since I used the fusible velcro, which totally rules! Your Wonder Wallet is fantastic! The Wonder Wallet does indeed have a lot of layers to sew through. Consider using a bigger needle, such as a size 12 or 14. That should help punch through that bulk, making it more Lazy. I just love that fabric. It's beautiful. Love your Wonder Wallet! Aren't these the best? I make them for gift card envelopes. Two gifts in one! What could be better than that? Love your fabric choice! So glad you are feeling better and able to get back to your passion....your wallet is fantastic! just LOVE the gorgeous fabric.....I purchased the pattern last week and expect to get a couple made this side of this century! Love your choice of materials. Way cute!! Kathy C.
Love your fabric! I often combine fabrics like this to squeak a WW out of leftovers - looks great! You can even patch two shorter pieces together to get the size for a pocket - hide the seam on the inside if you need to. Cindy...love your WW...the fabric is tres cool! Adorable! I love your fabric selection. That looks great! I'm considering purchasing the pattern, but don't know if I should with free wallet patterns out there. Do you love your wallet?